the world as reality and representation. 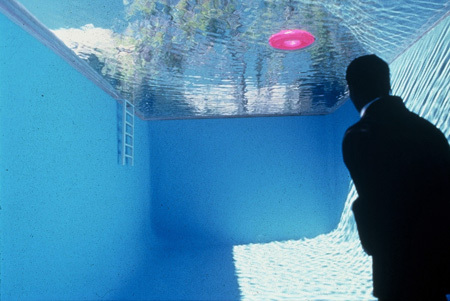 Leandro Erlich and Judi Werthein. Turism. Installation and participatory action. 2000. 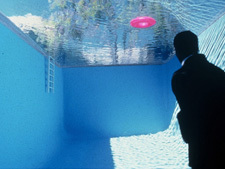 Leandro Erlich. The Pool. Installation. 1999. 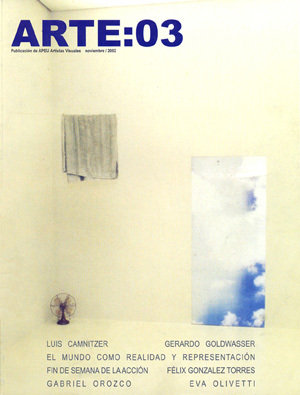 Arte:03, N	º 4, Montevideo, November 2002. (1) BORGES, Jorge Luis: “The Circular Ruins” in BORGES, Jorge Luis. Fictions. New York: John Calder Publishing, 1991. (2) NEWMAN, Barnett: “The Sublime is Now” (1948) in Barnett Newman: Selected Writings. California: The University of California Press, 1992. (3) KRAUSS, Rosalind: "Overcoming the Limits of Matter: On Revising Minimalism." in ELDERFIELD, John (ed). American Art of the 1960s. New York: Museum of Modern Art/Abrams, 1991. (4) LYOTARD, Jean-Francois: “The Sublime and the Avant-Garde” in BENJAMIN, Andrew (ed). The Lyotard Reader. Oxford: Basil Blackwell, 1989. Quoted in VAN DE VALL, Renée: “Silent Visions. Lyotard and the Sublime” in The Contemporary Sublime. Art & Design. London: Academy Group, 1995. (5) ADORNO, Theodor. Aesthetic Theory. Minnesota: University of Minnesota Press, 1997. (6) BENJAMIN, Walter: “The Work of Art in the Age of Mechanical Reproduction” (1936) in BENJAMIN, Walter. Illuminations. New York: Schocken Books, 1968. (7) JAMESON, Fredric. Posmodernism. Londres: Verso, 1991. (9) BORGES, Jorge Luis: “Tlön, Uqbar, Orbis Tertius” in BORGES, Jorge Luis. op. cit. (10) BURKE, Edmund. Philosophical Enquiry into the Origin of Our Ideas of the Sublime and Beautiful (1759). Menston, The Scolar Press, 1970. Quoted in WIXLEY BROOKS, Loura: “Damien Hirst and the Sensibility of Shock” in The Contemporary Sublime. op.cit. (11) SARDUY, Severo. Baroque. New York: Lumen Books, 1989. (13) FOSTER, Hal: “The Crux of Minimalism” in FOSTER, Hal. The Return of the Real. Cambridge: The MIT Press, 1996. (15) LACAN, Jacques. The Seminar Jacques Lacan: The Four Fundamental Concepts of Psychoanalysis (1964). New York: Norton, 1998. (16) BENJAMIN, Walter: “Little History of Photography,” in BENJAMIN, Walter: Selected Writings 1927-1934, Boston: Harvard University Press, 1999.